Once you pop, you can't stop! 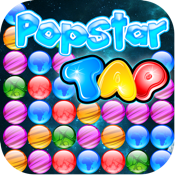 It is a fun and challenging bubble-sliding game with planets. Easy to learn, but hard to master. The object of the game is to clear the board by removing groups of planets of the same color. The more bubbles you clear in a single move, the higher your score and the further you can progress in the game. There is no time limit, but each stage has target points to proceed to next stage. 1. The more bubbles you pop, the more score you will get. 2. Try to clear all bubbles, you will get a lot of bonus.